Jon Skovron | The First Time story anthology is out! Nov 2 The First Time story anthology is out! I've mentioned the Debs many times. A group of YA authors with first novels debuting in 2009. Publishing is often a stressful, daunting, and confusing process. We came together to guide each other, to commiserate with each other, and to cheer each other on. So many incredible friendships were formed during that year. Quite simply, that group was a gift. In THE FIRST TIME, 25 young adult authors contribute 25 stories all about firsts: first loves, first kisses, first zombie slayings, and more. From humor to horror, and everything in between, these stories will make you laugh, cry, cheer, (and maybe even scream) as you experience something brand new from the authors that you love. My own humble contribution, called Looking Through One Eye, is set in the same world as Misfit (though not with the same characters). I hope you enjoy it! Complete list of contributors: Cyn Balog, Lauren Bjorkman, Leigh Brescia, Jennifer Brown, Kirstin Cronn-Mills, Janet Gurtler, Teri Hall, Cheryl Renee Herbsman, Stacey Jay, Heidi R. Kling, C. Lee McKenzie, Saundra Mitchell, Jenny Moss, Jackson Pearce, Shani Petroff, Carrie Ryan, Sydney Salter, Kurtis Scaletta, Jon Skovron (me! ), Kristina Springer, Rhonda Stapleton, Charity Tahmaseb, Jessica Verday, J. A. Yang, and Lara Zielin. 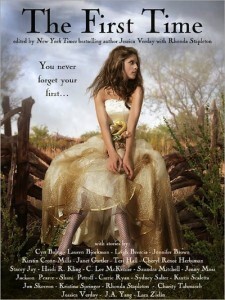 Nov 28 Misfit made the Kirkus Best Teen Books of 2011 List!